← Not just James Bond 007 British Secret Service agent has ‘Licence to Kill’ – is it now NHS hospital Doctors? When the Bank of England raised Bank Rate earlier this month, that was decided upon using the figure for inflation of 2.5% (the government’s inflation target, with primary aim of price stability, is actually 2%). Those numbers are based on the Consumer Price Index (CPI) – the other most used measure of inflation over the past 50 years is the Retail Price Index (RPI). Over some 30 years now the RPI has been consistently higher than CPI, sometimes significantly so [by 1.8% in 2011 and 1.4% last year] and this July it was 0.7% higher. Now, you might well wonder why the difference is important or why it should concern you personally? The answer rests with the very fact that OUR Government in an inflation trick, cynically switches between the two, to benefit itself, exactly like a common conman might do to trick the public and persuade us to believe they are honest traders, WHEN THEY ARE CERTAINLY NOT – the Government fiddle us consumers constantly and short-change us to the tune of many billions of pounds a year, don’t they? 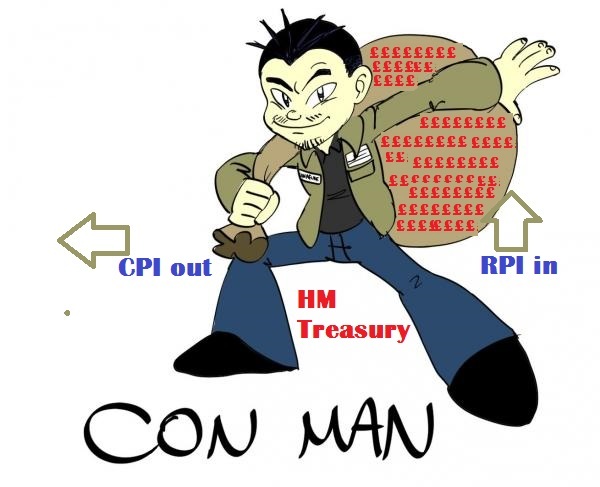 You see what our devious Government does, is to selectively use the LOWER rate (CPI) when paying OUT money and the HIGHER rate (RPI) when pulling IN money, eh? Now, the CPI was brought-in 15 years ago to replace RPI as the UK’s inflation measure [you guessed it, by a bloody EU directive in support of their euro (which we’re not in), no less?]. The Government seized their opportunity 7 years ago to stuff the pensioners by switching to CPI so that the State Pension would go up at a reduced rate in all future years. At the same time, they did that also to benefit increases, tax credits, changes to tax thresholds, and public sector ‘final salary schemes [including those such as in the NHS and for teachers] – saving the Treasury over a quarter-of-a-million BILLION pounds over the following decade – at the expense of us the general public, who have been cruelly cheated by it, haven’t they? On the other hand, the the RPI is a measure that affects the real day-to-day, and longer term, out of pocket expenses of millions of British people [because RPI INCLUDES the costs of housing (mortgage interest costs, rents, and council tax for example) while CPI most certainly does not – just WHO doesn’t need to have or live in a home, you might ask?]. Oh yes, the Government uses that ‘higher’ RPI index to maximise the interest rates it claws-in from student loans repayment, and also to annually bump-up rail fares [so the regulated ticket prices will go-up by 3.2% instead of the official inflation rate of just 2.5% – the greatest jump in 5 years (to line the pockets of the franchise holders and that is in spite of chaos, train delays, and their dreadful performance in providing a service in accordance with the timetables), while equally making travelers even poorer as wage increases won’t match the increases] – is that right or fair in anybody’s eyes, do you think? The tax rates on cars and on deemed ‘sin’ goods are increased in line with RPI, including ‘indirect taxes’ such as road tax, alcohol, tobacco duty, air passenger duty, and fuel duty. As you would expect, commercial outfits, having been shown the con-trick by the Government, and knowing that it is legit as it is employed by the authorities, have simply followed suit, and they have also developed a habit of choosing the inflation measures that best suit their self-interests, haven’t they? Yep, so again it is us ordinary people that will be losing out. When employers are negotiating wage increases they use the lower CPI rate to justify lower pay rises, but when firms are putting-up the cost of their products, they rely on the higher RPI to justify higher price hikes. They are as well, following the Government’s lead when it comes to company private pensions and replace RPI wit CPI when determining pension payments, so that retired employees get less income and the company saves a bundle – telecoms giant BT’s plan to do so, has though been squashed by the courts earlier this year (their claim that RPI has “become inappropriate” was thrown out – despite the BoE Governor Mark Carney also peddling that myth). However, the Government are now colluding with business and will try to bring-in legislation to allow employers or trustees to impose changes in inflation measurement from RPI to CPI – SHAME ON THEM ALL, eh?. This entry was posted in Banks, community, economy, establishment, EU, EURO, europe, European Union, financial, government, Housing, industry, manufacturing, Politics, retail and tagged cpi, pensioners, rail fares, rpi, State Pension, student loans. Bookmark the permalink.